Built in 1868, the 3 mast Barque operated for 80 years sailing the world including a final stint on the trans Tasman run bringing timber from New Zealand to Australia and finishing her career, like so many others, as a coal hulk in Melbourne. The Casablanca is 172 feet long and 600 tons. Dark conditions made for a challenging but fun dive, when managed to cover the entire length of the site, but the viz was only as good as our torches. Of all the sailing ships in the graveyard the Casablanca certainly has the most to offer the diver that is prepared to spend some time looking. The masts lie off to the starboard side of the wreck, the bow is broken off about 4 metres in and sits pointing to the surface. 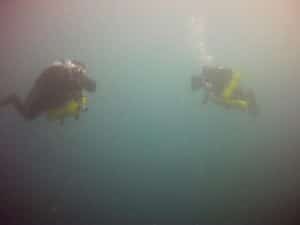 I buddied with Simon & Giullian and our dive was very enjoyable, although slightly chilly towards the end of deco. It was all worth the effort of the early start, the mixing of the gas and less than ideal conditions, we now turn our attention to another of the deep graveyard wrecks – John Nimmo?? Giullian & Simon on deco.